RIDGID introduces the Hyper Octane 6Ah Lithium-Ion Battery Pack. This new and improved battery provides 4x runtime over standard lithium-ion batteries. With Octane functionality, these batteries communicate with RIDGID Octane Tools to deliver maximum performance in high demand applications. 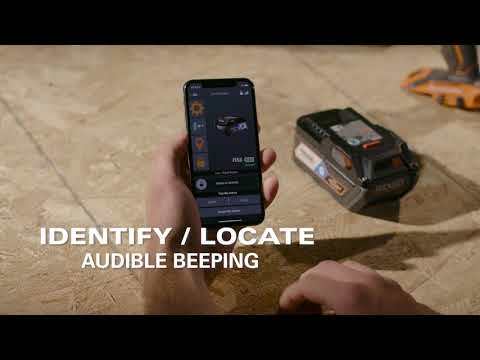 With Bluetooth Technology these batteries open up the jobsite to new levels with abilities to set Push Notifications, Security Features, and Battery Status Updates. This Battery is backed by a 3-Year Limited Warranty. 18V Hyper OCTANE Bluetooth 6.0AH Battery is rated 4.5 out of 5 by 4. Rated 3 out of 5 by Mblenman from Bluetooth features Not up to par yet. As these new octane batteries are nice and powerful there is a couple issues that need fixed. The Bluetooth features while great in theory dont work as people think. You can only track your battery as far as your Bluetooth signal will let you. So if you are getting these to track them if stolen YOU CANT! Once you are about 40ft away from your battery it will not pick up at all. You can not track, customize, lock, or unlock the battery's. So if someone did steal it you are out of luck, once Ridgid fixes this product it will be 5 stars. Even when im on the job it cant pick up until im 30 ft away. I am a huge Ridgid fan and use only ridgid tools, this is a real review on the octane batteries. Rated 5 out of 5 by Eddybouer from Beast of a battery I picked this up a few weeks ago and am surprised at the life it gives my high draw tools like the circular saw and Megamax. I used to think the tool wasn't very powerful but in reality it was the battery holding the tool back. The circ. Saw came to life with this battery! It's night and day difference with this battery. Is you have a high draw tool get this battery! Rated 5 out of 5 by Coolride38 from Great Power !! I use my cordless grinder a lot in my shop, and go thru batteries pretty quick. So, when I saw this battery I had to give it a try. The run time is significantly greater. It was so nice not to have switch out batteries as often. The power was also increased,which was a big surprise. The size is still pretty compact and not cumbersome at all. I'm very impressed. It also has the bluetooth feature. Which allows you to check battery status, charge time, you can also find th location of your battery or even turn it on or off. There are many other features with the free app. I think I'm going to get another one, it's well worth it. Rated 5 out of 5 by cfoote from A great addition for my tools I paired this to an 18V Brushless sander, trim router, and Octane Recip saw and it's like night and day. This is a must add for the tools that are battery hogs. Not only is the run-time increased but also the performance of the tools especially the Octane recip saw. Can't wait to pair this with the upcoming Octane tools. Do you need an octane charger with these batteries? Can I use my old charger?